Angely Mercado is the Managing Editor of the Bushwick Daily, a freelance writer, and a social media intern at Democracy Now! 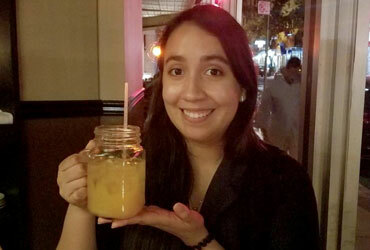 Born and raised in Ridgewood, she sees her work at the Bushwick daily as a contribution to the neighborhood that made her who she is today and a chance to improve both her writing and managerial skills. Keep reading to see what made Angely who she is today. Since mid-June, Angely has been working as the Managing Editor of the Bushwick Daily. This means working with contributors, holding meetings, monitoring content that gets published, making decisions on the kinds of pitches the Bushwick Daily receives, and guiding new writers. “It was a great opportunity that opened up and somebody that I know through the CUNY Graduate School of Journalism… reached out to me because she used to be a managing editor here a few years ago. She told that me she thinks I’d be great for the position and she really liked this job. I could tell that it was something that taught her a lot. So it was just a combination of a lot of different things: I could still freelance while doing this [and] I can still learn a lot of stuff so I just decided to go for it. Angely hopes to cover the present, the future, and also the past. She wants readers to recognize that there is a lot more to immigrant groups besides food coverage. From a young age, Angely’s family taught her the importance of civic involvement. Angely would watch the news and read newspapers in both English and Spanish at home. Her family valued knowing what was happening around them as it allowed them to make informed decisions. Growing up between Brooklyn and Queens, the most diverse area in the world, Angely understands that she needs to know what is happening. She has also interacted with people who are different from herself, helping her learn that there are many other perspectives other than her own. In addition to being raised by a family that emphasized the importance of the news, speaking with others has made her become curious as well. “I think you need that curiosity for journalism. You need that sense of ‘there’s a story here’ to do this job. And I think that led me to media. I started interning for different places when I was younger. Tried to freelance. I wasn’t very good at it at first because it was harder than it looks. As a woman and person of color, Angely felt especially out of place when she first started. Angely also notes that thriving in the media industry requires creativity, the courage to experiment, and go with your gut. Although Angely is constantly busy juggling her three jobs, she’s content.